478 pages | 78 B/W Illus. Interest in the phenomenon known as "lean" has grown significantly in recent years. This is the first volume to provide an academically rigorous overview of the field of lean management, introducing the reader to the application of lean in diverse application areas, from the production floor to sales and marketing, from the automobile industry to academic institutions. This handbook is an excellent resource for business and management students as well as any academics, scholars, practitioners, and consultants interested in the "lean world." 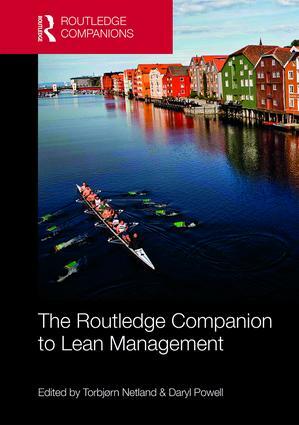 "Netland and Powell have done a wonderful job in bringing together the key writers on the Lean agenda. Anyone seeking to dig deeper in the field, either in the underlying philosophy or specific applications, will find much of value here. The book is unique in its breadth, giving an accurate reflection of the state of the art." "When Quincy Jones produced the song We Are the World, written by Michael Jackson and Lionel Richie, he gathered what he called ‘the supergroup.’ The most admired singers in the world contributed with their best tones in ONE song. This is a book where Netland and Powell have done the very same thing, but on the ‘lean arena.’ They have gathered the most admired ‘lean singers’ in the world where everyone contributes with their best ‘lean tones.’ This is a megahit! Enjoy the rhythm!" Torbjørn H. Netland is Chair of Production and Operations Management at the Department of Management, Technology, and Economics at ETH Zurich, Switzerland. Daryl J. Powell is the Lean Program Manager at the Subsea division of Kongsberg Maritime AS, Norway, and a visiting professor at the Faculty of Economics and Business at the University of Groningen, Netherlands.